South Vietnamese forces follow after terrified children, including 9-year-old Kim Phuc, center, as they run down Route 1 near Trang Bang after an aerial napalm attack on suspected Viet Cong hiding places on June 8, 1972. A South Vietnamese plane accidentally dropped its flaming napalm on South Vietnamese troops and civilians. The terrified girl had ripped off her burning clothes while fleeing. The children from left to right are: Phan Thanh Tam, younger brother of Kim Phuc, who lost an eye, Phan Thanh Phouc, youngest brother of Kim Phuc, Kim Phuc, and Kim's cousins Ho Van Bon, and Ho Thi Ting. Behind them are soldiers of the Vietnam Army 25th Division. (AP Photo/Nick Ut). Used by license. A few weeks ago I wrote about David Hume Kennerly and Nick Ut at the Vietnam Summit at the LBJ Presidential Library in Austin. Coincidentally a Los Angeles TV station, 4 Southern California, just did a news feature about Ut, so I'm passing the story on to whomever might be interested. The story not only provides the background on Ut's Pulitzer-prize winning photo, but it shows him working today in Los Angeles and covering every aspect of the news with his camera. 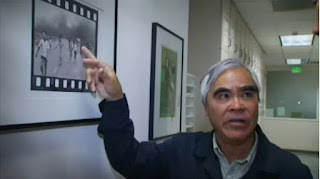 Ut & his famous photo in the AP office at Los Angeles.